In this chapter we'd like to show how you can position items inside of the form. Items' attribute position is the central character in positioning (can be defined for any item). It offers 3 relative positions and absolute positioning. To specify absolute item position you must set the attribute to absolute value. This way allows placing input and label of item whereever you like within the limits of the container. For example, it will be to the point when you need to change the default spacing between items. To split items into columns you will need the item newcolumn. Just put it between the items you want to split, and they will be splitted. See all the item's details in the appropriate chapter. You can also split columns through the absolute positioning. You can put items inside 'checkbox' and 'radio' elements. 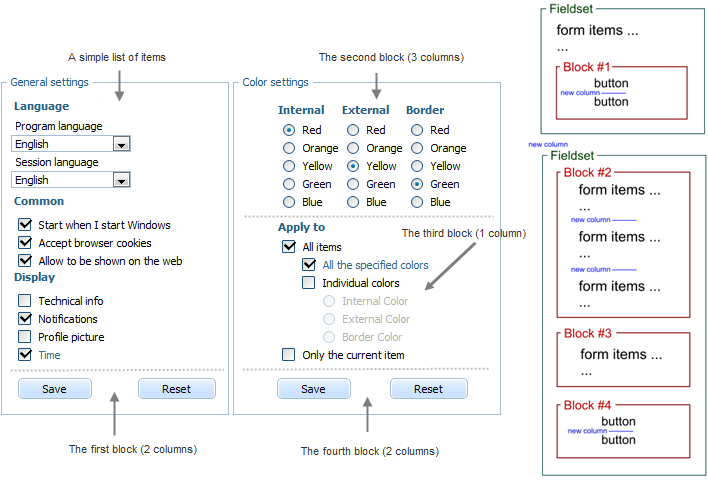 In this case, dhtmlxForm will define the active state of nested elements depending on the checked state of the parent item. In other words, if an item is not checked, its nested elements will be not active and vice versa. Nesting is implemented through the attribute 'list' where you should define nested items. You can associate some elements with 'select' item options. In this case dhtmlxForm shows elements associated with selected option and hides others. The item fieldset will allow you to unite some items on a page. The item block also allows to unite some items on a page. It's identical to fieldset but doesn't have label and frame. Most appropriate in situations when you deal with multiple columns and rows. The item settings will save your time and efforts thanks to the possibility of setting the same attributes to several items at once. See the detailed information in the appropriate chapter.